England's official anthem for this summer's European Championships goes on general release on Monday. The song, a new version of the Farm's 1990 hit single All Together Now, has been reworked by DJ Spoony and the St Francis Xavier (SFX) Boys Choir. It has been a hit twice before, hitting number four on its original release and number 24 when recorded by Everton FC for the 1995 FA Cup Final. The Football Association chose the song to encourage good behaviour. It was originally inspired by the unofficial armistice on the Western Front on Christmas Day 1914, which saw British and German troops play a game of football in no-man's land. Although it is expected to be a big hit for a third time, the song is facing stiff competition from the Euro 2004 unofficial anthem, Twisted X's Born In England. That track, which is released on 7 June and features XFM DJ Christian O'Connell, members of the Libertines, Supergrass and actor James Nesbitt, is currently top of the Amazon website's pre-order singles chart. Three previous songs recorded as England's official anthem for a major tournament have reached the top of the chart, including Three Lions by Baddiel and Skinner and the Lightning Seeds in 1996. A reworded version called Three Lions '98 reached number one during the World Cup two years later, outselling the official release by England United, who featured the Spice Girls among their line-up. To mark the release of the latest England anthem, the SFX Boys Choir will appear for a performance at Ely cathedral, in Cambridgeshire, on Monday evening. The Liverpool choir will arrive sporting the national team's football kit before donning their black cassocks for the cathedral worship. The 24 boys teamed up with the Farm after the band heard them perform at the 15th anniversary of the Hillsborough Memorial Service, at Anfield in April. Head chorister Nathan Carter told BBC Radio Five Live: "The video features football players and youngsters and the choir singing in the background. "It is about two gangs coming together to form a reunion. It is about world peace." Head of Music, Keith Knowles, who formed the choir in 1994, said: "To be chosen to perform on England's official song is wonderful for us. It ranks alongside our other exciting achievements like performing for the Pope." England's first match at the championships is against France on 13 June, in Lisbon. What do you think of the song? Send your views on the form below. The following comments reflect the balance of opinion we have received so far. Born in England is a great song, admittedly no Three Lions but a great, original, singalong track. Go and buy it and I can guarantee you will be singing along to it in no time. Wasn't this Labour's unofficial campaign song in 1997? Judging by some of the comments already posted from my British compatriots, I can see that you only need something as trivial as a song to bring out the xenophobe [jealousy?] in them. I'm sure Scotland and Wales would have released much better songs had their teams been actually good enough at football to qualify. I've not heard the Twisted X track but the band line-up itself sounds great. I just hope the whole tournament is as a fantastic spectacle as Italia 90 or Euro 94. Come on England!. I hate trendy football songs, give me brass bands and quasi-militaristic lyrics any day. This was never a good record anyway. This process is becoming more and more tedious. The football anthems of yesteryear where sung by the players. This is now one big profit-making scheme, and an opportunity for publicity seeking musicians of yesteryear (with careers going downhill). What a bore! At least all the songs, eg Anfield Rap, Back Home, Ally's Army all had player involvement. These are the memorable songs. The difference between Three Lions and all the other songs (including this new one) is that it was a feel-good, beaty, catchy tune. This new one almost sounds depressing. There's only one tune for England that really works for the crowd, and that's Three Lions. It should become the football anthem for the country - whatever the tournament, and however old the song becomes. I think this song should be banned from being sold as it will cause even more problems with relations with Scotland, Wales and N Ireland and I would love to see how many copies are sold within Scotland. I would assume very little. Even though "All together now" may have all the qualities the FA were looking for, I don't believe it will be a hit for the fans. 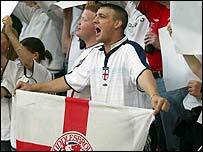 "Born in England" touches on what the English anthem should be but comes no where near to the Three Lions epic of 1996. The song should be about passion in England, a supporters' story if you like, the hardship and the glory! World in Motion just doesn't do it for me. I shall be pulling out the football album of 1996 and turning up the volume of Three Lions to sing my team to victory, come on lads!! I used to love the song, it always brings back great memories of the whole baggy/Madchester era... but as a Scotsman, I feel as though that's been robbed from me...I'll never be able to enjoy it again!! It's great. Being an England supporter I think it will give morale to our players. Thanks. Makes me glad Wales did not qualify just in case they decided to release a song. This one makes you prouder than normal not to be English! Awful. "It is about two gangs coming together to form a reunion"
What makes a great football song?